The wonderful Laura Pacino of Simply Adorning has a brand new tutorial out. It’s labeled Beginning Metals Fabrication-Bezeled Toggle Clasp. I had the opportunity to preview this ebook and let me just say it’s wonderful. I’ve had very little experience with metal fabrication. I took a class six years ago, but due to time restraints I never made anything other than some disks at a friends house, which means I barely remember anything. Oh, I vaguely recall filing and sawing and pickling, but if I were to sit down and try to make something, disaster would ensue. But I didn’t have any trouble following along with this tutorial. Laura even gives you part numbers for tools and materials so it’s easy to find the items she is talking about. I love that! Especially since I am such a noob. 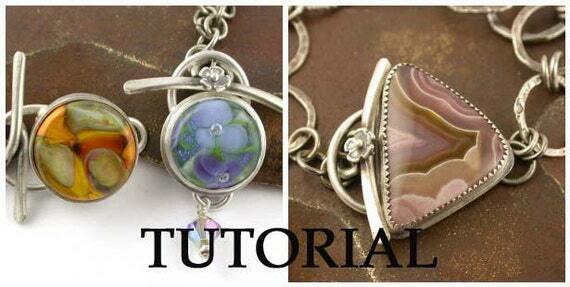 The tutorial is how to set a stone, but she also discuses tips and tricks for glass beads. See the picture on the left? The bead on the right is one of mine. Doesn’t it look gorgeous? Laura makes everything look awesome. Anyway, the tutorial is clear, the pictures are awesome, and since part numbers are listed, tools and supplies are easy to find. I’d say it’s well worth the $25 price tag. Check it out!